Chris Larson is a young man in a hurry. He had barely served half of his first term as an elected official, when the still-green county supervisor announced his run against incumbent Democratic state Sen. Jeff Plale for state senate. Larson didn’t just upset Plale in the September 2010 primary, he crushed him, winning 61 percent to 39 percent. 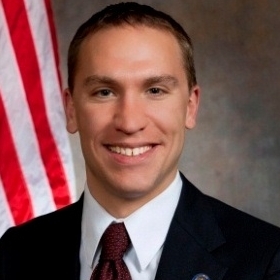 Then, less than two years after taking office as the youngest state senator in Wisconsin, Larson upset veteran Sen. Jon Erpenbach (D-Madison) in the election for senate minority leader. Just four-and-a-half years ago, Larson was a manager of some sporting goods stores. Now he could be the most important Democrat in the state legislature. That’s fine with Republicans, who seemed gleeful about Larson’s selection. “Sometimes, God gives you a gift,” crowed Assembly Speaker Robin Vos (R-Janesville). In little more than a year, Larson began lining up support for a run against incumbent Plale, a pro-life and pro-voucher Democrat who had enraged liberals by effectively killing a clean energy bill. Plale’s maneuvers “took it to a level of cartoonish evil,” Larson told Isthmus. “A lot of people are painting this campaign as the Don Quixote of the left, but we’re getting a lot of support from moderates,” Larson told the Madison weekly. Indeed, the challenger won remarkably broad support, with endorsements from the Milwaukee County Deputy Sheriffs’ Association, the Wisconsin League of Conservation Voters, AFSCME, Amalgamated Transit Union, Local 998, the Service Employees International Union, Wisconsin Federation of Nurses and Health Professionals, and the union representing MATC faculty and staff. Larson also did an aggressive door-to-door campaign. I moderated a debate between the two candidates, and Larson proved a smart, knowledgable speaker with a good feel for his audience. As a state senator, Larson won considerable publicity, often serving as a spokesperson for the 14 state senators who fled to Illinois in a futile attempt to stop the legislature from passing Act 10, the bill curtailing public employee union rights. Even before his victory against Plale, Larson had created the “Dem Team,” whose goal, Larson says, was “to give grass roots volunteers and campaign staffers the tools they need to run for office or help someone run for office. In Madison, people know how to run for office because there are a whole lot of people who are activists.” But Milwaukee didn’t have that sort of network, he felt. Milwaukee, Larson believes, doesn’t get a fair shake from the state legislature, and part of that is because it lacks strong enough leaders. Among the many trained by the Dem Team, Larson says, were Nikiya Harris, who ran successfully for the Milwaukee County Board in spring of 2010, Jason Haas, who succeeded Larson as county board member in 2012, Jose Perez, who won a race for Milwaukee alderman this year, and two new candidates who defeated incumbent legislators in the September Democratic primary: Mandela Barnes, who defeated incumbent representative Jason Fields, and Daniel Riemer, who ousted 29-year incumbent Peggy Krusick. Meanwhile, Harris won an open seat for state senate, defeating incumbent representative Elizabeth Coggs. All three of the winning legislative candidates were supported by Larson. He also supported another neophyte Democratic candidate, Evan Goyke, who defeated a huge field to win an open assembly seat in the Milwaukee area. When State Sen Mark Miller (D-Monona), who had served as Democratic leader in the senate, chose not to run for minority leader, Larson decided to run against the more likely choice, the far-more experienced Jon Erpenbach. The election became controversial, because lobbying groups like the Wisconsin Education Association Council (the formerly all-powerful state teachers union) and the League of Conservation Voters pressured senators to elect Larson. Some observers said this was unusual, though Larson claimed there were lobbyists calling on Erpenbach’s behalf as well. One of Larson’s supporters was John Lehman (D-Racine), a former state senator who won back his seat in a recall election, and says Larson helped him win election. “What Chris sold himself on was being involved in many other races, recruiting candidates, raising money and effectively helping people get elected,” Lehman told Wispolitics. Adding more controversy to Erpenbach’s defeat was that a last minute switch by one legislator gave Larson his victory. Insiders have speculated that State Sen. Bob Wirch (D-Pleasant Prairie) changed his vote. Wirch declined to confirm this, but did tell Wispolitics he wanted an appointment to the joint finance committee. No sooner was Larson elected than he appointed Wirch to joint finance, along with Jennifer Shilling (D-La Crosse). In giving Wirch the position, Larson dropped Milwaukee state Sen. Lena Taylor from joint finance. Taylor decried this, noting that its the first time in 30 years there was no African American on joint finance. Larson and Taylor have butted heads before. Taylor supported Plale against Larson and probably supported Erpenbach over Larson. The two were also on opposite sides on legislative elections. Taylor supported Millie Coby against incumbent Sandy Pasch, Elizabeth Coggs against Nikiya Harris and Jason Fields against Mandela Barnes in the September primaries. All three of her candidates lost, all to candidates supported by Larson. Then there is the question of Taylor’s effectiveness. A February 2009 Milwaukee Magazine ranking of all state legislators by Marc Eisen ranked Taylor as one of the ten worst legislators. With Republicans controlling both houses, they get 12 of 16 appointments to joint finance, so the outnumbered Democrats need very strong choices. Larson gets only two appointments, and his two picks, Wirch and Shilling, both have more than a dozen years experience in the legislature. C’mom Jim. That comment is beneath you. (It also exemplifies the difference between reporters and cheap shop bloggers.) Larson’s Dem Team has trained a long list of minority candidates, including African Americans Harris, Barnes and Eyon Biddle, Sr. who won a county supervisor seat and then lost a race for alderman. As for Larson’s support of Pasch against three black candidates, this race divided many Milwaukeeans and was the direct result of Republican redistricting — or was it mischief making? — that deprived Pasch of her district and forced this kind of election. In defeating Plale and replacing Fields with Barnes and Krusick with Riemer, Larson seems to be moving the Democrats further left, just as the Republicans have moved further right. We’ll see how that works for his party. And Larson and the Democrats will have a tough time having any impact in Madison, with the GOP controlling both houses. But Larson has injected a burst of energy into a party that appears to need all it can get. Maybe that’s what’s got Wigderson and company worried. -Did you miss this piece? : How Scott Walker’s rejection of Obamacare could hurt the state. -And Dave Steele offers a clear explanation of charter schools and how effective they are — or aren’t — at improving education. At the risk of being labeled a racist I have to say that Lena Taylor certainly deserves the clownish label before Larson. Larson will likely have little effect on statewide decision making. The liberals in Milwaukee and Madison have been effectively neutered by redistricting and Milwaukee and Madison continue to send radical lefties to the Capitol. You also missed Larson’s disorderly conduct conviction which is more recent then the shoplifting and was a disturbing case of anger issues. Shoplifting by a 19 year old is a nonissue. John, there was no such conviction, just a municipal ticket that went nowhere, the matter was dropped. Regarding Larson’s alleged “disorderly conduct charge.” Paul Revere and Martin Luther King where “disorderly”. “Disorderly” could be seen as a prerequisite for public office for those on the right, like Scott Walker, who think we need to shake things up in Madison. Also, having some “anger issues” on the left balances out the scales, which might be a good thing. C’mon Bruce. It is beneath you to suggest anything is beneath Wigderson. Democrats picked Chris Larson as their leader for the same reason Republicans picked Scott Fitzgerald over Dale Schultz. And a firebrand is of even greater value in the minority, especially when the majority is as dogmatic as Wisconsin’s Republicans. Stacy- Lason’s disorderly involved him interacting and acting threatening to a tow truck driver and refusing to leave his car after it had been hooked up and was being towed away. This is not a case of chaining himself to someone’s desk. Bruce- Disorderly is a threat of violence and to claim that nothing happened is just plain wrong. He received a ticket, he went to court, he paid the fine, and it is on his record. Through in the couple campaign finance violations and it is part of a disturbing pattern of Larson believing the rules do not apply to him. John, the only account of this I’ve seen is by the Journal Sentinel’s former conservative columnist Patrick McIlheran, who wrote that the matter had been dropped. He also didn’t give the impression of any threat of violence, but described Larson as being a “royal pain.” We’ve probably all been that on occasion. Big fan of Chris Larson, Lena Taylor and Nikiya Harris. All smart, passionate policymakers. I hope they can all get on the same page and present a united front on behalf of the greatest metropolis on Lake Michigan. While you did hint at it, you should probably have expounded on the fact that Larson was part of the group of people whose actions this last election cycle resulting in almost halving the number of African Americans in the Legislature. That helps explain his appointments to the Joint Finance and the lack of representation. Wisconsin’s Republicans are “dogmatic,” Art Hackett? But Chris Larson, he’s not dogmatic. He’s a firebrand. You’re still a newsman, right? But for public television. Seems like I said this before (but perhaps comment was scrubbed): Chris Larson says we can work together with Republicans after he has mau maued the Democrats who did work with Republicans. Hey Blaska, your comment wasn’t “scrubbed,” you made it on a Facebook page. “C’mom Jim. That comment is beneath you”? Oh, come now. If Larsen were a Republican, the Democrats would be saying that about him, and you’d be reporting it without commentary. So take the pious commentary and stuff it. The rules are the same for everybody. In the opposite situation, Democrats would be saying that about a Republican who did what Larsen did, and have, many times. So until Democrats join together and condemn any and every Democrat or left-wing activist who throws the race card at a Republican, they’re going to get it thrown at the, hard, every time. So Stacy Moss think that threatening a tow truck driver is righteous behavior, and passing laws using the democratic process is criminal. Good to know. Greg, I think you misunderstood my comment. Wigderson is a blogger and we have commented back and forth on each other’s columns. I’ve typically found Wigderson fairer than he was in this comment. What’s “unfair” about that comment? How often do lefties claim that Republicans “hate” gays just because Republicans don’t believe that the definition of marriage should be changed to benefit gays? The left throws around charges of hate, racism, and bigotry with gay abandon (see attacks on US Senators for objecting to Susan Rice). Until that ends, the left DESERVES to get it tossed back at them, all the time, every time. I’d challenge the Left to stop the hate, stop the vitriol, stop the ad hominem attacks, stop the emotional BS, and start having rational and logical arguments, but we all know that if the Left had to give up those tools, they’d have nothing left to say. When you jump down the throat of every Democrat / Leftie who takes a cheap shot at Republicans, then you’ll have the moral authority to complain about it coming from the Right. Care to point me to the article where you criticized the Washington Post et. al. for their claims that attacks on Susan Rice are because of “racism” rather than because we’re appalled that she went on national TV to tell falsehoods about the murder of four Americans, including a US Ambassador? No? Then you’re not qualified to complain about Wigderson’s entirely justified attack on Larson. Greg, I didn’t say your comment was unfair, just that you misunderstood me. I should note that Wigderson “liked”my story on Facebook, despite my shot at him. And I fully expect he will take shots at me in the future. And we’ll both bear up. You’re taking a comment between commentators and turning it into something it isn’t, a feud between political parties. In the recent election, Democrats received 51% of the votes for US House in Wisconsin but won only 3 of the 8 seats. This reflected the gerrymander by Republicans in the last legislature where a supermajority of Democratic voters were stuffed into a view districts. The same techniques applied to the legislature will make it very difficult for Democrats to win a majority in the next ten years, unless they learn to reach out to voters who have not traditionally voted Democratic. Given his history is Larson able to do this? It’s great to know about the work being done by the Dem Team. This is the kind of effort that is needed (and the results show it) to recruit new people to participate in politics without having inside connections and/or a huge bank account. Perhaps this work will be so successful that by the time the next redistricting is done, it will be completed with ethics and honesty driving the process. Maybe Wisconsin could even adopt a system similar to Iowa’s. There are some things Larson can do to make the Dems stronger: first, Obama won Wisconsin by six points, and Tammy Baldwin had a similar margin. This tells me that Wisconsin is not a majority Republican state, and that the Republicans had to gerrymander to get their majority. The Dems have the numbers to win statewide offices, and a firebrand is required to recruit-and rally the troops around the candidate. And there are other parts of the state aside from Madison and Milwaukee where the Dems have a strong showing; Dale Schultz for example is concilliatory in part because he knows that his district is nowhere near as conservative as the present Republican leadership.